Behe finds his bugbear in evolutionary theory's view that "random mutation" provides the raw material for evolutionary change. And to understand his critique, we first have to grasp how mutation fits into evolutionary theory, and what scientists mean when they say that mutations are "random." If evolution is a car, then natural selection is the engine and mutation is the gas. Although evolutionary change can be driven by several processes, natural selection is almost certainly the main one -- and the only one that can adapt organisms to their environment, creating the misleading appearance of deliberate design. Yet natural selection, which is simply the preservation of genes that give their possessors greater reproductive success than their competitors, cannot take place without genetic variation. Although Darwin had no idea where this variation came from, we now know that it is produced by mutation -- accidental changes in the sequence of DNA that usually occur as copying errors when a molecule replicates during cell division. We also know that mutation-generated variation is pervasive: different forms of genes produced by mutation, for example, explain variation in human eye color, blood types, and much of our -- and other species' -- variation in height, weight, biochemistry, and innumerable other traits. Once the variation exists, those genes that enhance an individual's "fitness" are preserved, and those that reduce it are discarded. (Natural selection is not really a "process," but simply a description of the differential and adaptive survival of genes.) The polar bear, for instance, has a white coat (its hairs actually lack pigment but appear white because they reflect light), and since this color is unique among bears, the polar bear presumably evolved from a dark-furred ancestor. The likely scenario is that mutations occurred that produced individuals varying in their coat color. Bears with a lighter coat had an advantage over others, for they would be more camouflaged against the Arctic ice and snow and better at sneaking up on seals. Lighter bears would then outcompete darker ones at getting food and thus produce more offspring, leaving more copies of the "light-coat" genes. Over time, the population of bears would evolve lighter and lighter coats until they were almost invisible against the snow. On the basis of much evidence, scientists have concluded that mutations occur randomly. The term "random" here has a specific meaning that is often misunderstood, even by biologists. What we mean is that mutations occur irrespective of whether they would be useful to the organism. Mutations are simply errors in DNA replication. Most of them are harmful or neutral, but a few of them can turn out to be useful. And there is no known biological mechanism for jacking up the probability that a mutation will meet the current adaptive needs of the organism. Bears adapting to snowy terrain will not enjoy a higher probability of getting mutations producing lighter coats than will bears inhabiting non-snowy terrain. What we do not mean by "random" is that all genes are equally likely to mutate (some are more mutable than others) or that all mutations are equally likely (some types of DNA change are more common than others). It is more accurate, then, to call mutations "indifferent" rather than "random": the chance of a mutation happening is indifferent to whether it would be helpful or harmful. Evolution by selection, then, is a combination of two steps: a "random" (or indifferent) step -- mutation -- that generates a panoply of genetic variants, both good and bad (in our example, a variety of new coat colors); and then a deterministic step -- natural selection -- that orders this variation, keeping the good and winnowing the bad (the retention of light-color genes at the expense of dark-color ones). It is important to clarify these two steps because of the widespread misconception, promoted by creationists, that in evolution "everything happens by chance." Creationists equate the chance that evolution could produce a complex organism to the infinitesimal chance that a hurricane could sweep through a junkyard and randomly assemble the junk into a Boeing 747. But this analogy is specious. Evolution is manifestly not a chance process because of the order produced by natural selection -- order that can, over vast periods of time, result in complex organisms looking as if they were designed to fit their environment. Humans, the product of non-random natural selection, are the biological equivalent of a 747, and in some ways they are even more complex. The explanation of seeming design by solely materialistic processes was Darwin's greatest achievement, and a major source of discomfort for those holding the view that nature was designed by God. Is it possible that Behe does not know this body of data? Or does he just choose to ignore it? Behe has quite a record of declaring what is impossible and of disregarding the scientific literature, and he has clearly not learned any lessons from some earlier gaffes. He has again gone "public" with assertions without the benefit (or wisdom) of first testing their strength before qualified experts. For instance, Behe once wrote, "if random evolution is true, there must have been a large number of transitional forms between the Mesonychid [a whale ancestor] and the ancient whale. Where are they?" (12). He assumed such forms would not or could not be found, but three transitional species were identified by paleontologists within a year of that statement. In Darwin's Black Box, he posited that genes for modern complex biochemical systems, such as blood clotting, might have been "designed billions of years ago and have been passed down to the present … but not 'turned on'." This is known to be genetically impossible because genes that aren't used will degenerate, but there it was in print. And Behe's argument against the evolution of flagella and the immune system have been dismantled in detail (13, 14) and new evidence continues to emerge (15), yet the same old assertions for design reappear here as if they were uncontested. I know my fellow evolutionists will like the book, because now they have the excuse to write yet more articles against IDT. For myself, with so many important issues waiting for attention in our society, I am just a bit depressed that anyone would think that something like IDT is worth pushing or that it gains so much attention others have to spend time refuting it. Certainly, if I were a Christian, I would be terrified of it. If God really does have to get involved in His creation every time something complex needs producing, why does He not get involved in His creation whenever something simple but awful needs avoiding? Many genetic diseases are the product of just one molecule gone wrong. Surely an all-powerful, all-loving God could have taken five minutes off from creating the irreducibly complex to tweak those rogue molecules back into line? If you have not read Darwin's Black Box, then read it to find out what the controversy is all about. 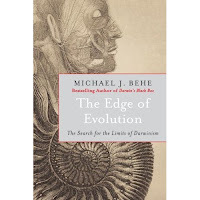 If you have read Darwin's Black Box, then don't bother to read The Edge of Evolution. Same old stuff, without the style of the first book.